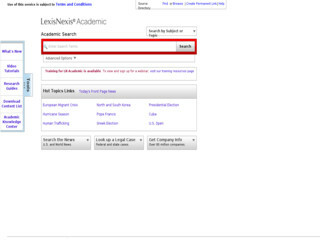 LexisNexis Academia or Academic Universe has a rich collection over 15,000 business, legal and news sources. It provides access to thousands of newspapers, periodicals, televisions and radio broadcasts, newswires, blogs, corporate directories and financial information. Search deep back files of local, regional and national newspapers from around the world. LexisNexis Academia is the only database which provides legal information of almost all countries around the world. Search and downloading facility is also very much user friendly. Lexis Academia is also IP based access and accessible within NLU, Delhi Campus. It is a collection or more than 2000+ Academic Journals; more than 1000+ Law Reports; Legislation of more than 100+ Countries; 100+ Newspaper.